Scoresby Sund, named after the English explorer William Scoresby, who in 1822 mapped the fjord area in great detail, is an inlet system of the Greenland Sea on the eastern coast of Greenland. It has a main body approximately 68 miles (110 km) long which branches into a system of fjords covering 14,700 sq miles (38,000 km2). The depth of some of its fjords is as much as 4,760 feet (1,450m). Scoresby Sund is the largest and longest fjord system in the world. The Rodefjord, which is located in the Scoresby Sund fjord system, well above the Arctic Circle, just 1,300 miles (2,100km) from the North Pole) has across part of it an extremely shallow area of less than 10 feet (3m) in depth which has trapped hundreds of icebergs in a small area - the Iceberg Graveyard. 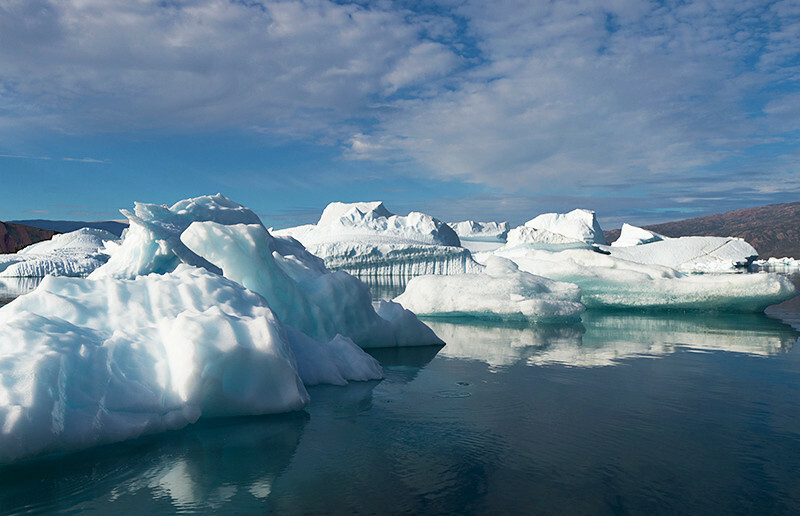 Slowly these icebergs, which will never travel again, are melting into the fjord. A zodiac cruise through this iceberg graveyard gives everyone spectacular views, as is seen below.